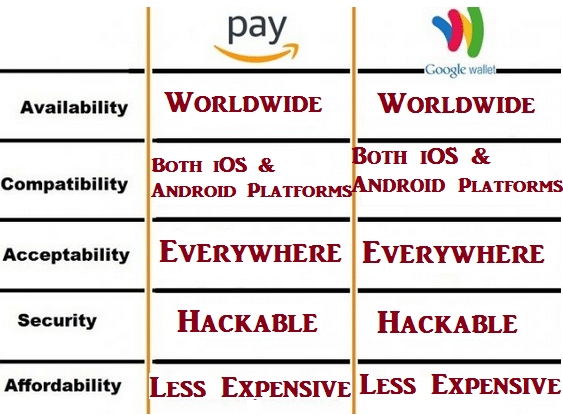 Online Music Store Amazon Pay vs Google Wallet, Have You Decided, Yet? Google Wallet and Amazon Pay are among the leading digital payment providers for online retail business transactions. Both platforms operate the same way but they have distinct features that set their over all performance apart. Developed by Google, Google Wallet came to life on May 26, 2011; however, it was replaced by Android Pay on June 30, 2016. On the other hand, Amazon Pay is the property of Amazon.com which was launched in 2007 but services were limited to the United States. Globally, Google has the largest number of users who also have access to Google Wallet for free. For years, people have trusted the platform to provide services that are accessible to majorities despite their geographical location or language. Despite the friendly nature of Google services, Google Wallet demands users to fill a lot of information to complete set-up. As a result, the process becomes exhausting and people avert to other simpler alternatives. On the other hand, Amazon has limited users compared to Google. Amazon Pay is mostly available in English and it’s services are currently limited to the United States, United Kingdom, India and selected countries in Europe. Before Google Wallet was replaced by Android pay, it’s infrastructure was messier which motivated Google to set up the system afresh. Amazon Pay, on the other hand, is accompanied by a strong IT structure and it is recognized world wide for it’s efficiency. Google Wallet has several features that enhance customer transactional experiences and secure their details. For instance, the Google Wallet NFC Tap and pay technology makes it easier to process transaction while the virtual card issued upon set-up protects user’s real personal details from frauds. Other features include sending money through gift cards, loyalty programs, and debit cards. With Amazon users are not required to set up another account. Instead, they enjoy automatic recurring payments with Amazon Pay, mobile-friendly responsive widgets, back-end service calls, a custom integration and inline checkout among others. Since both services store different loyalty and gift cards, Google Wallet happens to have powerful solutions when you add any supported reward card. Transaction errors are easy to track with Google Wallet because it stores every detail transmitted through Google servers. With Amazon Pay, some transactions may not go through because the system relies on the initial details the user filled while setting up an account. Suppose you moved away and the current gift card has your new address; Google wallet will be able to pick up the changes since a new set up was made. To access payments, Google Wallet and Amazon Pay require a four-digit PIN but their lock system is different. Amazon PIN is used to lock out users from specific cards while Google Wallet uses the pin to access the app depending on the set time-out period. 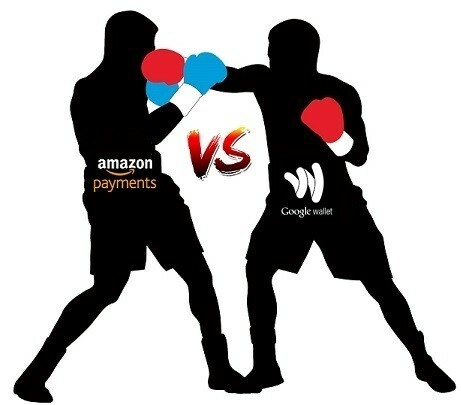 According to recent statistics, Amazon pay has a sizeable market share compared to Google Wallet yet it is the most underestimated payment provider in the world. In 2016, Amazon came in second after PayPal in the category of the most preferred payment method. Google Wallet came in fourth with 7% preference record from the US. Amazon has attracted few Major shareholders and other numerous sites to its payment platform. It has a global partner program that allows easy integration of other providers. As an online retailer, Amazon has grown globally with over 280 million paying subscribers and more than 10 million active users’ from different sites. Marketers expect Amazon to invest heavily in digital payments especially by improving online deliveries. Also, expanding into new territories (countries) has increased their market share by a higher margin. On top of that, they incorporated software companies as a way to reach the retailers and merchants. With the help of new innovations, both brands have a long way to go. While Google Wallet benefits from massive traffic, Amazon Pay thrives from years of good reputation and a potential to expand. Each has unique abilities to come out on top but competition is stiff. A majority of people are tired of debit cards and credit cards. Fear of being robbed has increases the demand for digital payment; however, many potential users lack confidence when online security threatens their savings and assets. So far, Google has survived major hacking incidences but has a long way in improving infrastructure. Amazon Pay is already supported by a strong IT structure that ensures programs run without delay. Although Google is trusted by most people, both brands exist to offer similar services using different tactics but their goal remains the same; to come out on top.